The mighty Amazon region occupies 60% of Peru and is an unmissable wilderness experience best enjoyed on board a river cruise. 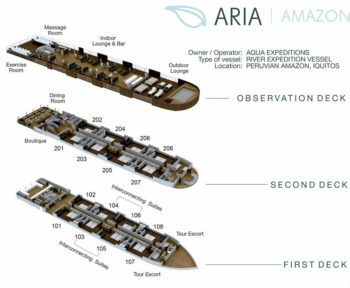 The Aria Amazon offers 32 guests the opportunity to sail deep into Peru's Amazon wilderness in style and comfort. The 16 over-sized staterooms all feature en-suite seating areas, generous beds, and wall-to-wall panoramic windows. The observation deck with outdoor jacuzzi and the lounge are also splendid places to sip a pisco sour and watch the world go by. Executive Chef Pedro Miguel Schiaffino, one of Peru's star chefs, created the Aria Amazon's gourmet menu. Fine South American wines are included at every meal. Daily water-based excursions on comfortable launch boats allow guests to experience such wonders as pink dolphins and six-foot-wide water lilies, to fish for sharp-toothed piranha, and to interact with the people who live out their days along the river. Expert guides provide rich narrative detail about life along the Amazon as they visit little-known areas such as the remote Pacaya Samiria Reserve. Twice the size of Yellowstone Park, it teems with wildlife and aquatic life including the endangered pink Amazon dolphin, black caiman, and three-toed sloth. 16 suites (8 Design Suites measuring 23.2 square meters /250 square feet on the first deck and 8 Design Suites measuring 23.2 square meters / 250 square feet on the second deck). All outside-facing with floor to ceiling panoramic windows. All air conditioned with en suite sitting areas. Four interconnecting suites for families.